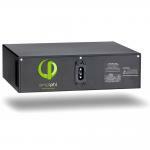 This 12 volt 100 amp hour AGM sealed lead acid battery is the valve-regulated type (sometimes called "sealed" or maintenance-free), which fixes the acid electrolyte in an absorptive fiberglass mat, and is considered a group 27 battery. Most of the sealed batteries under about 30 amp hours are AGM, or absorbed glass mat. 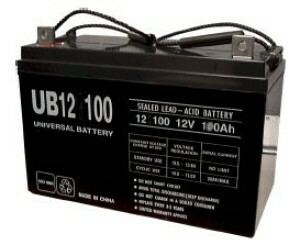 This 100 ah size is found in industrial equipment, marine applications, RV, scientific devices, solar, etc. They are sometimes only used as a backup battery, or APS system, constantly float charged, only providing power if the primary power (AC) goes out. In this role they routinely last 5 years or so. In cyclic applications, where they are discharged, the life will be a funtion of the depth of discharge, and the frequency. A routine 100% discharge will give about 250 cycles, whereas a routine 30% discharge will give about 1250 cycles. 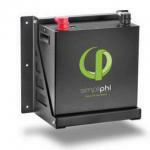 So keeping lead acid batteries charged whenever possible, extends their life. Using a microprocessor controlled charger is part of this proper battery maintenance, for maximum life. We recommend opportunity charging, for example, in an industrial application, where the batteries are charged each night, or even during the day when not in use, to keep the average depth of discharge above 50%, which helps with longer cycle life.